A few weeks ago I cycled up into Gatineau Park, just outside of Ottawa in Quebec. It’s nice having wilderness this close to the city, even if I don’t use it enough! My target was Pink Lake, about 8km inside the park boundary and that made for a 30km round trip. It’s hard work getting there (the lookout in the photo is about 120m or 400 feet above when I started) but good fun free-wheeling most of the way home. I didn’t know anything about the lake (there are a lot of them around and I assumed it was just like the others). However, when I saw the interpretation signs at the site I noticed it was “meromictic”. What this means is that the lake waters never entirely mix and it produces a fairly special environment for life. The signs gave some information about the biological implications which I thought I would share. Most lakes are “holomictic”, meaning that they mix occasionally, usually once or more per year. Holomictic lakes can either be polymictic, where there is lots of frequent mixing (e.g. shallow lakes where the wind churns the water), dimictic, where the lake mixes twice per year, or monomictic, where ice prevents mixing in the winter and so the lake only mixes once per year. Meromictic lakes mix very rarely, if at all. This can originate from two conditions: either (i) the sides of the lake are very steep so it is physically difficult for the lower waters to mix upwards, or (ii) the lower waters are highly saline which makes them more dense than the less saline upper waters. The whole of the Ottawa Valley, as well as a chunk of Quebec and parts of northern New York and Vermont were covered by the Champlain Sea during the last glaciation (13,000-10,000 years ago, see the map below for the extent of the ). This sea was formed by ice depressing the rocky crust to a point below sea level. As the glaciers retreated the sea flowed in, creating an inlet from the Atlantic Ocean. Sea water was retained in the lakes of the region, but gradually became freshwater over time as fresh rainwater washed in. Pink Lake appears to have been an exception and desalinated (turned from salt water to fresh water) very slowly. I’m not certain, but this would explain the lack of mixing if there was a chunk of sea water still sitting in the depths. While I was at the lake, I heard a father telling his son about the biology of the lake. He said “There’s a special species of fish in the lake called a three-spine stickleback that isn’t found anywhere else”. That surprised me, since I had pulled stickleback out of a number of local ponds during a recent field study. When I looked into it, I found out that there is a special population of the three spined stickleback (Gasterosteus aculeatus) living in the lake. This species is found all over northern Europe and North America and is interesting for a number of reasons. First, it exists in two distinct groups: a migratory group which, like salmon, spend part of their lives in the sea but come back to freshwaters to breed, and a freshwater group which spends all of its time in freshwaters. Second, when it colonises freshwaters the species appears to differentiate into individuals that feed in the water column (the “limnetic” form) and those that feed on the lack bed (the “benthic” form). These two groups rapidly develop distinctive morphological differences to the point that taxonomists would almost consider them different subspecies. There are actually populations of three-spined stickleback in Kidder Lake, Holly Lake and Ramsay Lake, as well as Pink Lake, which more closely related to the migratory (anadromous) form than the freshwater form (Rubec, 1975). The reason that Pink Lake (altitude 532 feet above sea level (a.s.l.)) is considered to contain a unique population is that it was certainly inundated by the Champlain Sea around 12,000 years BP. The other three lakes lie at higher altitudes (Kidder Lake 679 feet a.s.l., Holly Lake 653 feet a.s.l.and Ramsay Lake 657 feet a.s.l.) which are close to the highest altitude of marine waters (between 623-656 feet a.s.l. ; Richard and Occhietti, 2005) and so may not have been inundated. You can see that the three lakes lie outside of what is generally considered to be the extent of the Champlain sea from the map below. When Pink Lake was cut off from the Champlain Sea, a population of stickleback were trapped. In most cases they would not have survived because the transition from salt water to freshwater would have been rapid. However, Pink Lake is only fed by rainwater from a relatively small catchment, meaning that desalination occurred over a longer period of time. According to some recent research on the sediments in the lake, the transition to freshwater began around 11,800 years ago and by 10,000 years ago there was a biological community present which suggests that the water was just about fresh (Neville et al. 2011). It turns out that this change from salt to freshwater was gradual enough that the fish were able to adapt – not a great surprise given their use of freshwater during breeding. As well as its history, the fact that the lake doesn’t mix leads to some fairly interesting biology. Bacteria in the bottom of the lake exhausted the oxygen there and are forced to use “anaerobic” respiration to survive. This produces a toxic chemical called hydrogen sulphide which kills fish at very low concentrations. However, one group of organisms do extremely well in these conditions. Purple sulphur bacteria (see the picture of the jar to the left, photo courtesy of Pond Conservation at the Garden Pond Blog) use the sulphide instead of water during photosynthesis. They use light just like other photosynthesising organisms do, but because they do not use water (H2O) there is no oxygen (O2) given off – instead, granules of sulphur are produced. Because they need light which is near the surface as well as sulphide which is near the bottom of the lake, these bacteria occupy a band around 7m from the lake bed. This is a perilous position, as oxygen is highly toxis for them so any mixing of the upper layers can result in large numbers of bacteria being killed. So all-in-all it is a pretty interesting lake! Boyko, M. (1973) European Impact on the Vegetation around Crawford Lake in Southern Ontario. M.Sc. thesis, University of Toronto, Botany Department. Dickman, M.D. (1979) A possible varving mechanism for meromictic lakes, Quaternary Research, 11: 113-124. Neville, L.A., Macumber, A.L., Patterson, R.T., Michel, F. and Pisaric, M.F.J. (2011) Thecamoebians as an indicator of paleolimnologic change in meromictic Pink Lake, Gatineau Park, Quebec. Joint Annual Meeting of Geological Association of Canada, the Mineralogical Association of Canada, the Society of Economic Geologists and the Society for Geology Applied to Mineral Deposits. May 25-27, 2011. University of Ottawa, Ottawa, Ontario. Richard, P.J.H. and Occhietti, S. (2005) 14C chronology for ice retreat and inception of Champlain Sea in the St. Lawrence Lowlands, Canada, Quaternary Research, 63: 353-358. Romanelli, R. (1975) The Champlain Sea episode in the Gatineau River Valley and Ottawa area, Canadian Field Naturalist, 89: 356-360. Rubec, P.J. 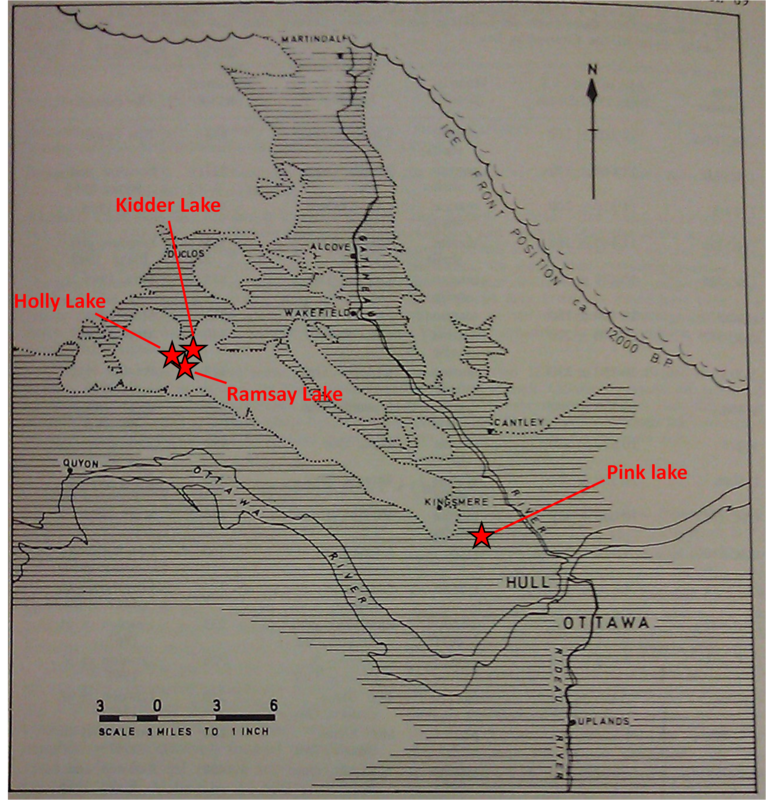 (1975) Fish distribution in Gatineau Park, Quebec, in relation to postglacial dispersal, man’s influence, and eutrophication, Canadian Field Naturalist, 89: 389-399. Interesting expansion on the meromictic lake descriptions found elsewhere. I am one of the heathens who used to swim there and probably kicked plenty of shoreline detritus in, contributing to the algae growth. I was a kid, dinosaurs roamed. 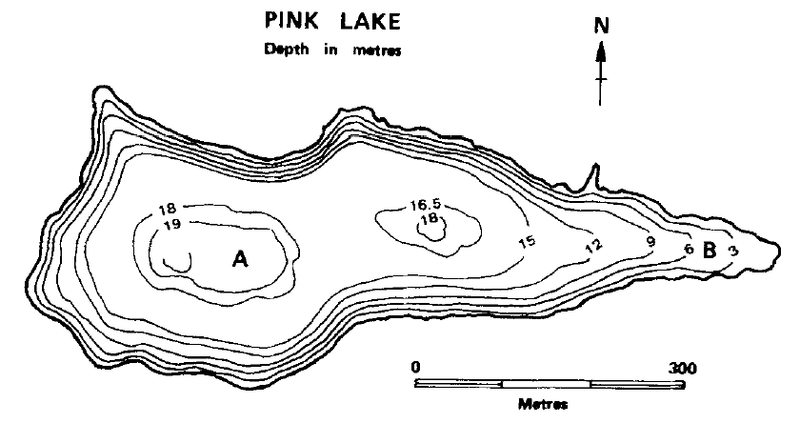 We kept an area myth going that Pinks Lake was ‘bottomless’. Can you tell us anything about it’s actual depth? The best record I could find of the depth was the depth profile that I have tagged onto the end of the post. It doesn’t have a precise measurement for the maximum depth, but it must be around 20m (65 ft). Deep enough to seem bottomless!